Keeping track of battery life on your phone can be a major stressor for the obsessive compulsive. Battery Status is the perfect app to put those worries to bed. Gathers reports on your battery life and average charge times. 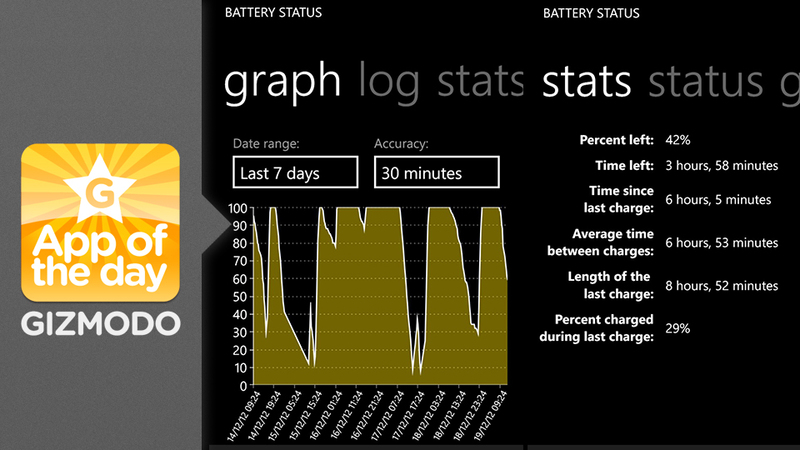 Graphs battery drain speeds and gives you a detailed log of your device's battery life every 30 minutes. Battery Status comes either paid and free. The paid version of the app gets rid of the ad banner, which is a must if you don't want the app to use wifi (killing the battery further). The app uses a well-designed live tile that can update with the current power percentage. A graph shows your gradual battery drain and charge times for up to the passed month. You'll also see a stats pane that lists average charge and drain times and specifies the last time your phone was plugged in and how much was charged the last time it was. Battery Status keeps a log of battery percentage every half hour, so you can pinpoint how and when you drain your battery the most. You can also take advantage of Windows Phone 8 lock screen notifications so you always know how low or full your tank is.